This year’s Mahiai Match-Up first place winners, Kaivao Farms, in Hamakua (Pahoehoe), on their awarded parcel. Photo courtesy of Kamehameha Schools communications office. Before Western contact, Hawaii was able to grow enough food locally to sustain its population. In marked contrast to the past, Hawaii imports approximately 85-90 percent of its food, aspiring local farmers face high barriers to entry due to exorbitant land prices, equipment that must be imported from the mainland or elsewhere, and a lack of sufficient farmer training. Additionally, Hawaii hosts an aging population of farmers, most of whom are a few years older than the national average. This volatile mix of agricultural challenges leaves the state particularly vulnerable if a sudden disruption in food imports occurs. To help insure the state’s food security, Kamehameha Schools (KS) and Pauahi Foundation joined forces in 2009 to create the annual “Mahiai Match-Up” competition. Its primary goal is to find farmers and help them overcome barriers to entry so that they can tackle food security issues in the state. The competition awards two winners each year, who receive access to prime agricultural land with up to five years of waived rent, as well as a $35,000 in shared seed money. “We have so much land of agricultural value, and we are in a position to support local food production, and find good talent,” says Sato. “[The Mahiai Match-Up] allows us to encourage people who are out there to get the entrepreneurial spirit going, and get them out on the land. Even though this is making their dream come true, the benefits are much greater than just that; the benefits are community and food security. [This contest] seals our commitment to agriculture, and supports that concept.” says Sato. In addition to proof of established residency, applicants must submit a business plan and go through several selection cycles. Contest winners are selected by a panel of local food policy experts during the annual application process, which is open to the public. To win, a project must create a plan that not only results in an economically viable agricultural operation, but also provides an educational component to the public. “Farming is not only about science, it needs to be economically feasible to provide for yourself and family, unless you are finding time on the side to farm.This contest allows entrepreneurial types to get their foot in the door. Normally, when you focus on farming, sometimes it is difficult to include an educational concept, and having an educational concept in the contest is a great part of (the contest).” says Sato. The competition awarded its third set of recipients this past July. The first place winner was Kaivao farm, LLC, which was awarded a $20,000 prize along with 9.5 acres of agricultural land in Pahoehoe, on Hawaii island. In addition to their plan to grow traditional starch crops, the farm will serve as a living classroom, and cultivate secondary crops that are used in traditional art-forms, such as kapa cloth-making and weaving. Self described as, “a private, charitable trust founded and endowed by the legacy of Princess Bernice Pauahi Bishop,” KS operates statewide to serve students of Native Hawaiian ancestry. 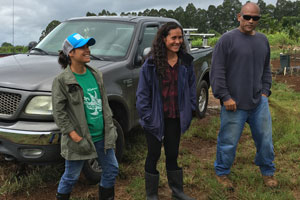 As one of the major players in land management in Hawaii, they have laid out a Strategic Agricultural Plan to address food security issues in Hawaii. The plan includes a commitment to increasing the market share of locally grown food products, investing in agricultural facilities, and restoring traditional agricultural systems. Their mission is financially supported by its endowment, which supports educational needs for people of Hawaiian ancestry.